For use on mini-excavators or backhoes, these compactors are designed to work anywhere a boom can reach in trenches, around foundations, on slopes or seawalls. HP 35ME/65II/75 Series compactor/drivers can safely compact trenches, often eliminating the extra cost involved with a walk-behind unit and the added expense of trench boxes or shoring. They are also ideal for setting posts and driving steel sheeting used for retainer walls. All sizes are built for rugged, reliable performance with hardened steel components to resist the effects of stress, vibration, fatigue and impulse forces. All compactor/drivers feature rubber shock absorbers, which protect the carrier’s boom by isolating it from HydraPak vibrations. All models incorporate hydraulic motors with built-in cross-over check valves to better adapt with today’s carriers. The HP35 ME was specifically designed for use in narrow trenches with a footprint of 12 inches. With an unprecedented range of hanger brackets, many HP Series can quickly connect to specific OEM mounting systems, including Wain-Roy, Weldco-Beales and CP to name a few. The HP65 II and HP 75 feature the patented SwitchHitch mounting system, an indexing disc which can easily be rotated to meet the OEM pin, centers for most backhoes, and mini-excavators. For carriers not able to utilize SwitchHitch, we also offer the HP65 II and HP 75 with Floating-Boss mounting systems to ensure quick delivery. Hanger brackets with flat tops for bolt-on OEM top caps are also available for all models. With a wide range of impulse force of 3,000 pounds to 7,800 pounds, all HP Series units are built for rugged, reliable performance with hardened steel components to resist the effects of stress, vibration, fatigue and impact forces. 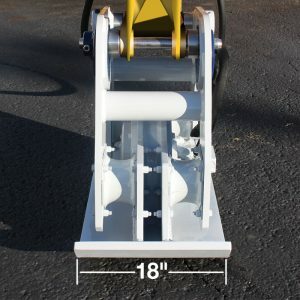 Eliminates costly trench boxes and shoring. Drives sheeting for retaining walls. Rubber shocks absorb vibration protecting the carrier’s boom. Available with O.E.M. bolt-on top cap. SwitcHitch and Floating Boss configurations on HP65 II and HP75 eliminate costly OEM mounting brackets. * Weight and Height are specific for HydraPaks with Flat Top (FT) Hanger Assemblies, less mounting bracket. For accurate weight and height for models utilizing a different or specific hanger arrangement, please contact our Engineering Department.